Over the past few months and years there has been a mortgage product that is gaining momentum in the market and it a 5/5 ARM or an Adjustable-Rate Mortgage. 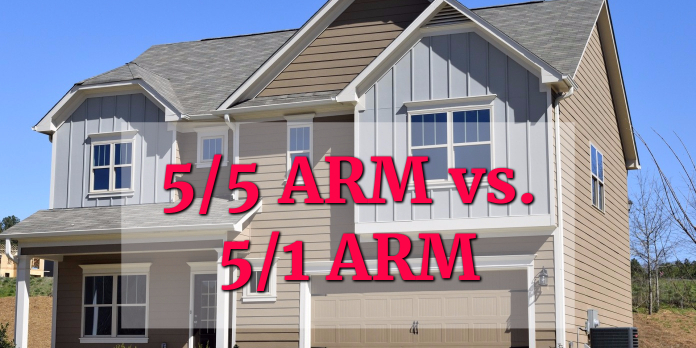 Now before we go into what a 5/5 ARM is, the first thing you need to know is how an adjustable-rate mortgage works and what you would expect from this type of loan. An adjustable-rate mortgage is a loan where after the initial time period of the loan being at a fixed rate, the loan adjusts at set periods to coincide with the current market values for the cost of borrowing. Now the mortgage rate can adjust up or down which will increase or decrease your payment and there is normally set caps to the max amount the loan can adjust at one time and the max rate the loan can have before it is capped as well. ARM loans became very popular leading up to the Great Recession and Housing Crash where interest rates were well into the 6% range and borrowers were looking to purchase homes and normally ARM rates are significantly cheaper than your 30-year mortgage rates due to the risk involved on taking out these types of loans. The change in interest rate that you will see on an ARM loan is normally tied to an index that will determine if your rate is going to rise or fall during the adjustment period. There are many different indexes out there where lenders will get their information from and these show the return on investment for U.S. Securities or other investments. One of the main indexes is called the LIBOR or the London Inter-Bank Offer Rate. Now on 2nd part of your mortgage rate besides the index is the margin. This is how lenders will go about putting together your new rate during the adjustment period is to add a fixed percentage as laid out in the loan which is their margin. So let’s say your ARM is calculated on LIBOR + 2% Margin and current LIBOR is 3.25%, your rate for the next period is going to be 3.25% + 2% or 5.25%. There is always risk involved with ARM loans especially when they are taken out in times of low interest rates such as the last handful of years. The risk gets brought into play because if rates start increasing, you could be seeing a significant increase in your mortgage rate when the adjustment period takes place. 5/1 ARM: This is the ARM that sticks out to most borrowers when they are shopping for a mortgage and in this loan the first 5 years act like a fixed 30-year loan and every after that there is an adjustment period where the rate updates. 5/5 ARM: The new ARM poduct that gives you a little more stability in the sense that after the first 5 year “fixed” term ends, your rate can only adjust every 5 years going forward. So if you think about it in your first 10 years of ownership, your rate will increase just 1 time. 7/1 ARM: This is an ARM product that gives you the first 7 years of the mortgage at a fixed interest rate and then will adjust every year after that. Since your up-front fixed term is a little longer, the rates aren’t as attractive as the shorter 5 year options. 10/1 ARM: This ARM has a 10 year fixed period to start the loan before it goes into adjusting every year after that. This is the longest of the ARM products and since you have a fixed-rate for 10 years to start the loan the savings versus a 30-year fixed is minimal. In a literal sense, this could mean that after your initial 5 years at a 3% rate, your rate can increase to as much as 5.0% and seeing that there is a 2% margin in the loan, the loan can never go lower than 2%. With the Lifetime Cap of 4%, this means that the rate for this loan will never adjust higher than 7% or 3% initial + 4% lifetime cap. Since mortgage rates don’t appear to be going much lower than the initial rate, your main focus in a time when mortgage rates will be increasing is to make sure you are prepared for rate increases. There are only adjustments to your rates every 5 years instead of most other ARM products which are every year. 5 Rate Adjustments for the life of the loan in years 6, 11, 16, 21, and 26. The stability with not having to worry about a change mortgage rate every year. Since you are given adjustments only after every 5 years, your rate versus the 5/1 ARM will be slightly higher since the adjustments won’t be as frequent. If you don’t plan on being in your home for more than 5 years or plan on refinancing your loan within 5 years, there is no need to lock into a 5/5 ARM when a 5/1 ARM would suffice. Initial Caps on the 5/5 ARM may be higher due to the fact that the adjustments happen so few and far between. Where a 5/1 ARM normally has a 1% cap per adjustment, the 5/5 ARM can be as high as 2% cap per adjustment. With the popularity of ARM products in today’s housing market, it is wise that as a borrower you make a strategic decision when looking into an ARM loan. Here at Loan Consultants we are here to help you in giving you all the information you need in order to make a loan decision that fits your goals and plans. For the most part if you plan on selling your home or refinancing before the initial fixed rate period is up then an ARM product is right for you. However, if you want to stay in your home for 10+ years, getting a 15-30 year fixed mortgage may be your best bet. As mentioned, every scenario is different, so if you call me today we can go over all your options and you can choose what is best for you. To get started please give me a call at 888-900-1020 today!